Wet ground: especially bogs and conifer swamps, often on sphagnum hummocks; swamps, alder thickets, wet hollows in rich deciduous forests, sometimes on mossy logs; mossy rock crevices, meadows. Our plant is subsp. pallens (DC.) M. S. Baker or var. pallens (DC.) C. L. Hitchc., sometimes recognized as V. pallens (DC.) Brainerd. Many keys and descriptions notwithstanding, the lateral petals in var. pallens are glabrous or at most with a few short hairs (not strongly bearded). The flowers are usually somewhat smaller than in V. blanda and V. renifolia. 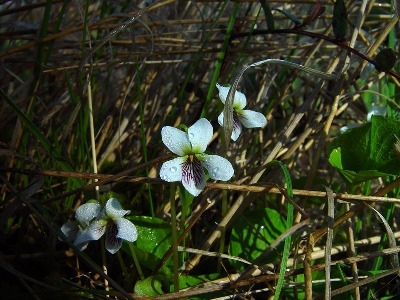 Flowering plants may be as small as 1.5 cm tall or 10 times that size; the flowers almost invariably overtop the leaves. In V. blanda and V. renifolia, the flowers are often about equal to the leaves or even shorter. MICHIGAN FLORA ONLINE. A. A. Reznicek, E. G. Voss, & B. S. Walters. February 2011. University of Michigan. Web. 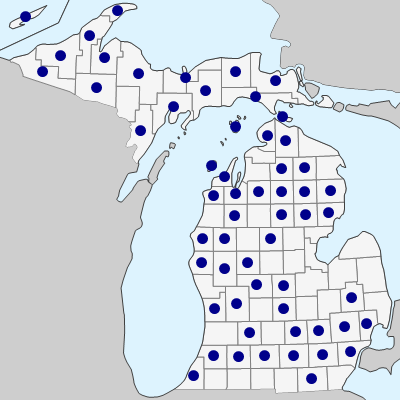 April 19, 2019. https://michiganflora.net/species.aspx?id=2785.